Looking forward to the Thanksgiving meal but dreading the bloat, possible weight gain and sleepiness afterwards? The average Thanksgiving dinner clocks in at 3.000 calories…gasp!! So follow these simple tips and swap outs and be thankful for a fun filled, guilt-free day of celebration! 1. Start the day off right with a metabolism boosting workout like a Thankgiving Day 5K (I’ll see you there!) or an at home gut busting burn. 2. Fill up on the good stuff. Start with soup…yep…hot liquids make you feel fuller, so scoop up a healthy bowl full of goodness like this festive butternut squash soup. Gravy…that’s right, I said gravy. It’s only about 80 calories per 2 tbsp and is more than half the calories of the sugary cranberries. Bring a protein and fiber packed dish like quinoa. I make a yummy one with sweet potatoes and black beans; you have to try it! 3. Skip the bad stuff. 4. Ditch the drinks…just kidding. But remember that alcohol lowers your inhibition with what you put in your mouth (as well as what comes out of it) so just be careful. 5. Stay awake. While napping during the game might seem like a good idea, a better idea for increased energy is to go on a brisk, post-feast walk. Not only will you get your blood circulating, heart rate up and thus an avalanche of energy, but you’ll also be burning off some of the pie you just ate! 6. Relax…it’s a holiday. Although you don’t need to overindulge so much you make yourself sick, it’s still a holiday with some special food that is a one-day-deal. So, take a bite of everything that’s special to you and skip the stuff that’s not. A few months ago, some dear friends of ours brought us dinner and a similar quinoa dish to the one below was with it. I LOVED it and over the months have made it over and over and over again, tweaking it here and there for my love of spice and hate of extra calories :) Here is my version of a vegan main or side dish to die for. Enjoy!  Spray cookie sheets and spread cubed sweet potatoes on them and spray potatoes with cooking spray, and sprinkle with salt and pepper. Roast for 25-35 minutes, stirring every 10 minutes, until potatoes are soft in center.  While potatoes are roasting, prepare quinoa according to package directions substituting water with vegetable broth. Set aside.  To make the vinaigrette, combine lime juice, liquid smoke, cumin, chipotle, salt (to taste), and agave nectar, whisking until well integrated. While whisking, slowly drizzle olive oil into bowl until fully integrated. Taste & make adjustments as necessary. 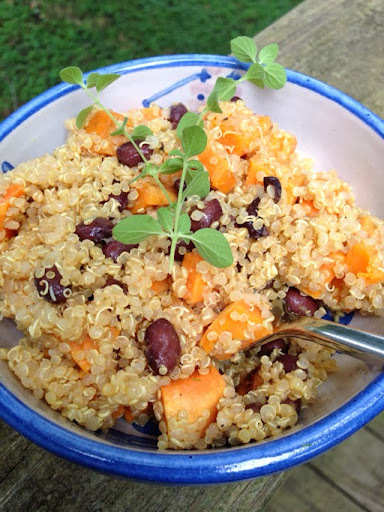  In large bowl, stir together the black beans, roasted sweet potatoes, and quinoa. Pour vinaigrette over ingredients and toss until well coated (you might need more if you like a bit more flavor). Rake your body (and your yard) into shape! If you raked your yard in the wind storm this weekend, give yourself a little pat on the back, because you burned some major calories. And if you haven’t gotten to your yard yet, there’s still time for you to rake yourself into shape. Raking uses a bunch of different muscle groups which makes it a great calorie-burning workout. You can burn 250-400 calories depending on how hard you are working. If that’s not a reason to get outside to get those leaves out of your yard, I don’t know what is! Make ‘em Harder: Raking with a heavier rake will up the calorie burn of this great exercise/lawn care activity as will bagging the leaves by hand. My little family loves pancakes for breakfast…and I love to make them for them, but they can be soooo unhealthy. So, I created a recipe that is both delicious and can be eaten by a dairy free and gluten free person-yippee! 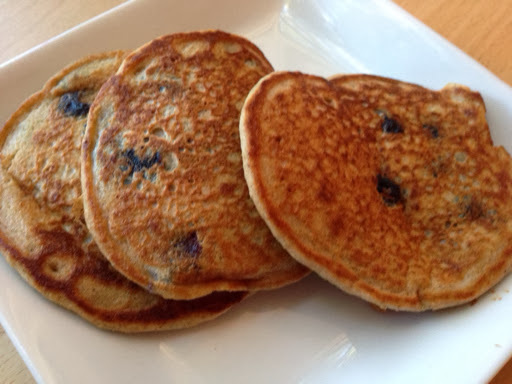 Although the recipe below is for classic pancakes, at my house we add all sorts of things to our pancake batter: blueberries, cranberries, nuts and even the occasional chocolate chip J Just remember, that whatever you add to your ‘cakes, you need to add to your calorie count. Work off some of that Halloween candy and help keep your body lean and strong during the holidays with this do-anywhere, calorie-crushing workout. Do it Tabata-style (20 seconds work, 10 seconds rest). Do each of the 8 exercises once for one set, repeating it 8 times (or as many as you can and then work up from there). Need a little extra to counter your candy-binging — or because you’re just a badass? — do a bonus set of 30-second jumping jacks between sets. I didn’t grow up eating Brussels sprouts, but a few years ago someone made them for Thanksgiving, and since then I’ve been hooked. Though it may have a bad reputation, when prepared correctly, this in-season leafy vegetable is delicious and simple to prepare. 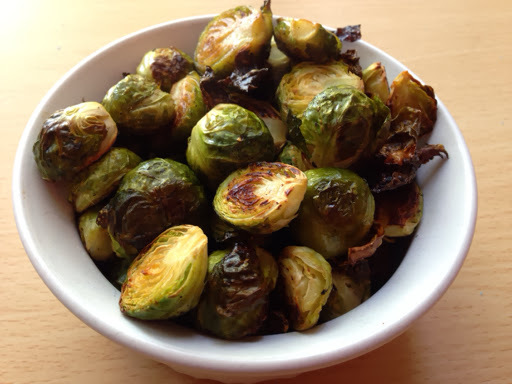 Even better, Brussels sprouts are packed with fiber, antioxidants, and cancer-fighting properties. Preheat oven to 400 degrees. Trim the stems of the Brussels sprouts and cut in half. Spray a baking sheet with cooking spray and arrange the Brussels sprouts (and their fallen leaves) in a single layer. Season with salt and pepper. Bake for 45 minutes, stirring every once in a while. Those little fallen leaves will crisp up, and they are DELICIOUS! You can eat the entire batch for about 165 calories, or you can share with a friend for 83 calories, 4 grams of fat, 11 carbs, 4 grams of fiber, and 4 grams of protein. Feel free to add your own spices and additions (cranberries/almonds and bacon/maple syrup are two of my favorite combos). Just know that when you add ingredients, you need to add them to your calorie intake as well. Chili is delicious, but can be a huge calorie bomb. This slow cooker recipe, however, is still delicious, but only 140 calories per cup and is full of fiber and protein and overall yumminess. Nutrition per 1 cup serving (makes 12 servings): 140 calories, 3 grams of fat, 17 carbs, 6 grams fiber, 12 grams protein. The "fall back" daylight savings time used to be my favorite holiday because I got another hour of sleep...yeah! Now that I have a toddler, it just means getting up even earlier...not yeah. Plus, with it getting dark before we start eating dinner, my energy is WAY low...and so is everyone else's that I've spoken to since Sunday. So this week, I thought we would focus on how to gain some energy without drinking Starbucks out of coffee, sneaking a nap in your office, etc. Eat for energy. You might get a quick energy boost from that handful of M&Ms or a chocolate chip cookie, but you will crash and burn just as quick. So fuel your body to keep you energized all day long. Eat healthy carbs such as oatmeal, tons of veggies and fruit and remember to always eat protein with every meal or snack. Think almonds, tuna, chicken, turkey, walnuts, natural peanut butter and tofu. Think of your body as an engine and you are providing high grade gasoline when you eat well. Listen for energy. Put on some heart thumping tunes for a kick! 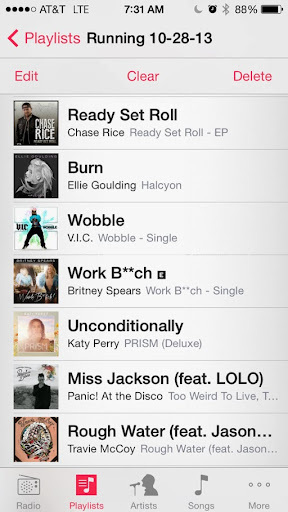 I've got just the playlist for you! Enjoy your new found energy! I'm loving this new playlist; half of which I Shazammed at the Chiefs' game, so you know it's blood pumping beats. I would just go ahead and put it on repeat for your run, walk, super sets, kitchen dance party and call it a calorie burning day.